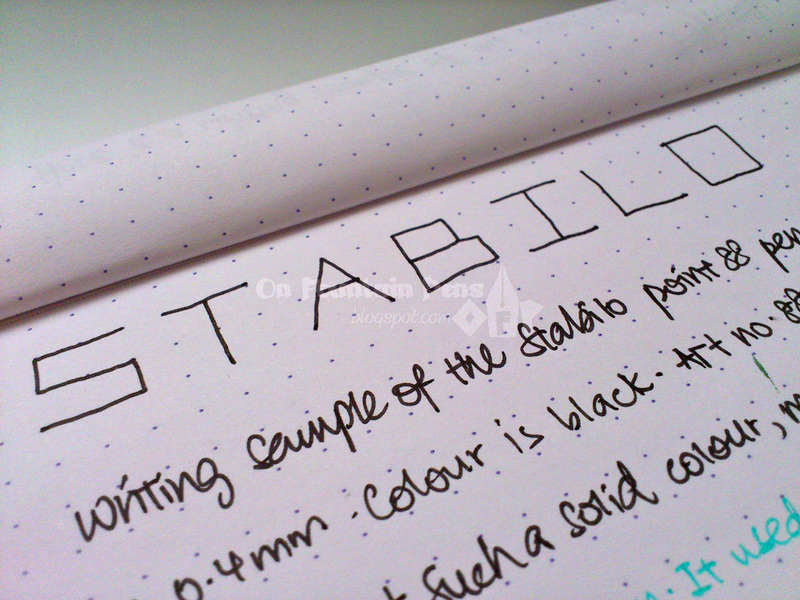 This is my very first review of Stabilo products, so let’s rejoice! It means that I am scrutinizing more stationery brands for review on my blog, and I do hope that this would help you guys out there who are looking for an opinion on pens! Yesterday during lunch, I just decided to make a trip down to a shopping mall near my office to get some snacks for my snack cupboard (I believe everyone has one in the office. If you don’t have one, get one!). By some unknown magnetic force, I was drawn to the Popular Bookstore where there is of course a huge array of stationery. There were so many new pens, and so many familiar pens. Which pen should I buy? My decision was made when I had a sudden memory of my secondary school life, which was likely the Golden Age of my stationery explorations (bought a few new pens weekly). So I got some Pilots and Stabilos, which I will be reviewing today and in the next few days. The 3 Stabilos that I am reviewing today are namely the Stabilo Pen 68, Stabilo point 88 and Stabilo pointVisco. 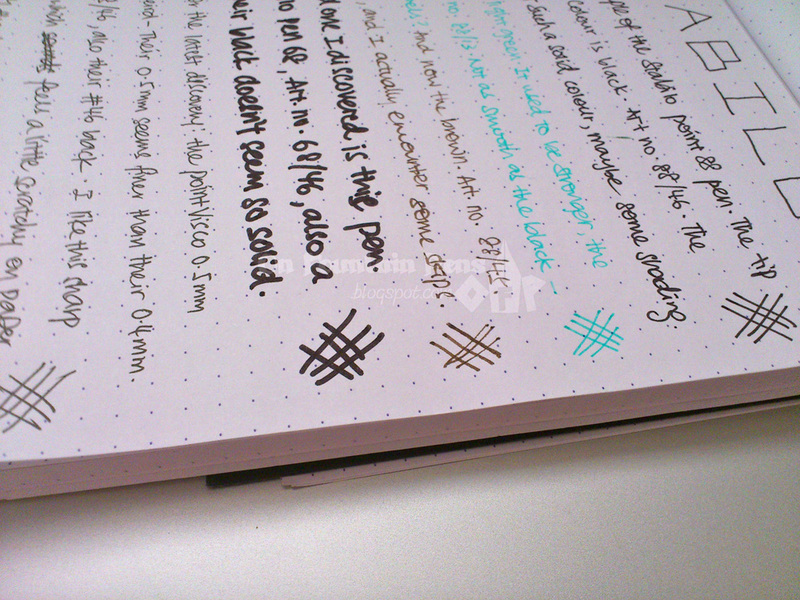 The point 88 used to be my default note-taking pen because of the wide variety of colours that it came in. I have mentioned before that I loved to make colourful notes out of the stuff I needed to study, with the excuse that I remember better when I write things down (but my grades were only so-so in the end, actually). The other excuse was that the point 88 used to cost below 1 SGD and I could buy a substantial number of it with my meagre pocket money then! I had known of the existence of the Pen 68, but never ever used it until today. The reason is that it is a felt-tip pen, which I found almost no use for since I was already using the ZIG Clean Colours. As for the pointVisco, it was the first time I have seen this gel pen on the market. I don’t know how new this product is except that I’m pretty sure this was released in the recent few years (at least for Singapore). Now for the product description first. These pens are long and thin. 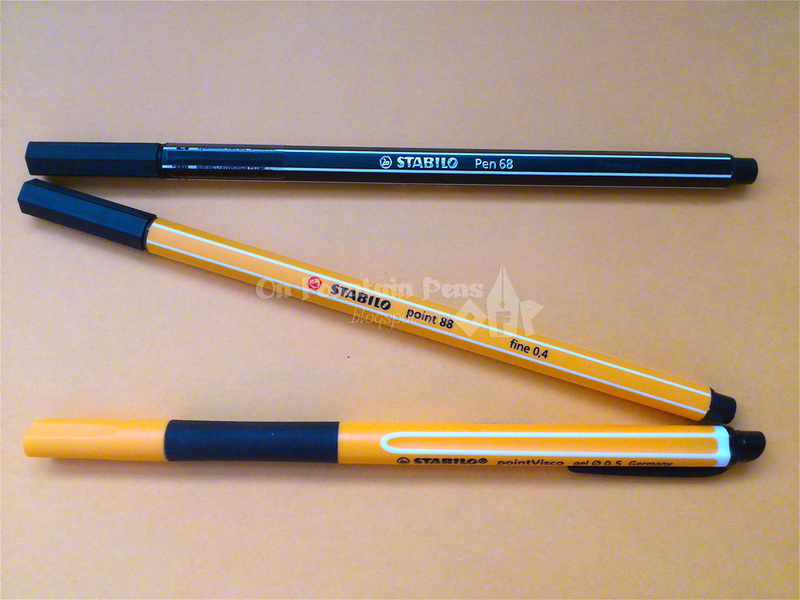 The Pen 68 and point 88 are very similar, both measuring 0.8cm in diameter, 16.8cm in capped length. That is almost 2/3 the thickness of and slightly longer than the Noodler’s Ahab! When posted they are 18cm long. The pointVisco is slightly shorter, at 16.3cm capped and 17.5cm posted. I chose black colour for all to simplify the comparison. 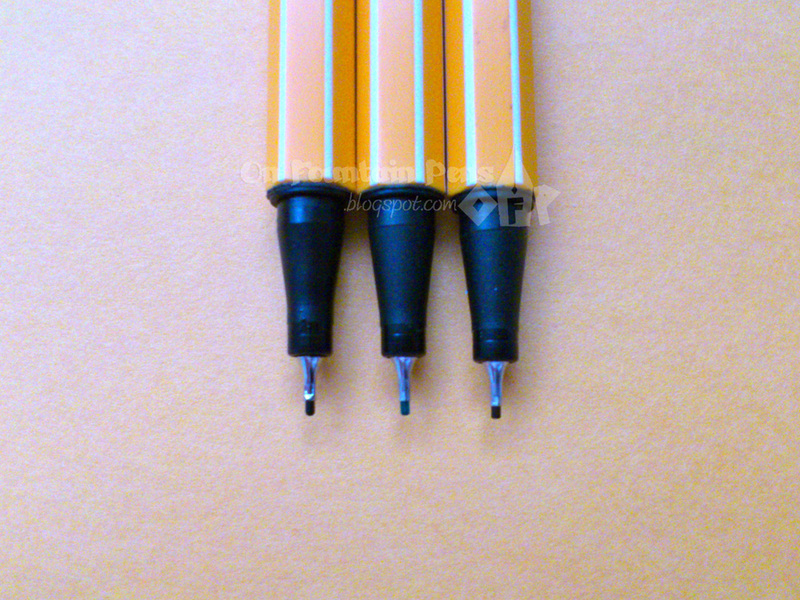 1) Pen barrel has a modified hexagonal shape. 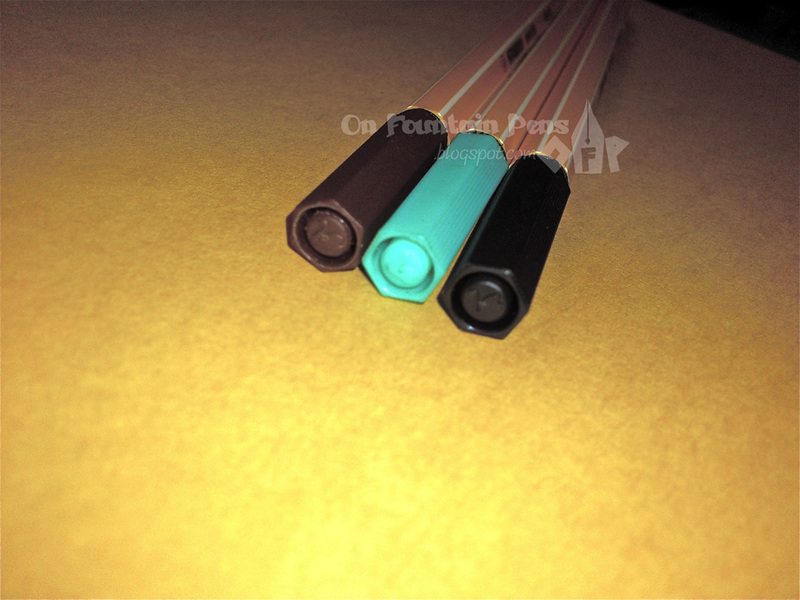 The other two pens have a hexagonal shape throughout the pen body except for the butts. The pointVisco has a hexagonal cross-section too, but the 6 sides are alternately concave and convex. 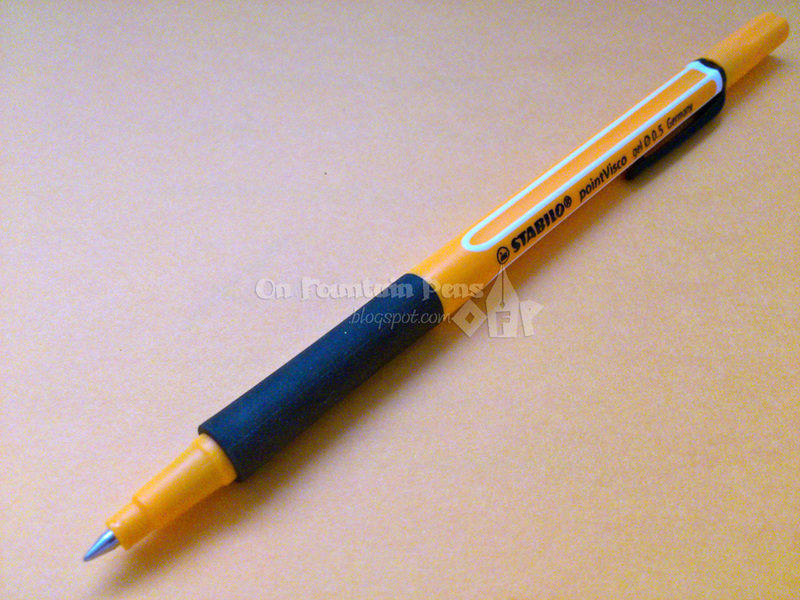 This design reaches up to halfway down the pen, and the remaining half to the cap of the pen is round. The fact that the pointVisco has a different shape of the pen barrel makes it susceptible to rolling too, so I guess that’s why Stabilo has added the clip. 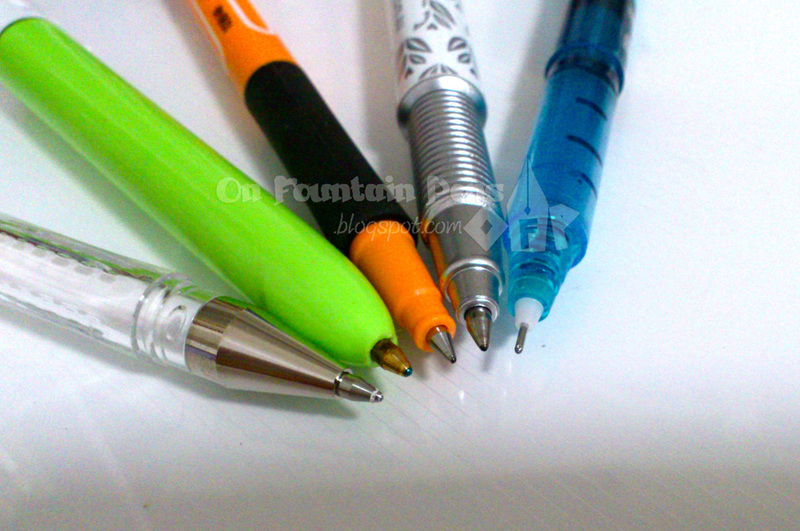 The clip is small and not intrusive, but even such a design would prevent the pens from packing up nicely like in the above picture. I’m personally not a clip person, but just to let you know, this clip is pretty sturdy. Which would be good if you like sturdy clips. The caps of all 3 pens are a little dangerous to me. I imagine a scenario where I accidentally drop all three caps into a tiny hole and, obeying Murphy’s law, the caps would fall one after the other headlong into the hole, never to come out again. You may feel that I am paranoid, but look at what I found attached around the Pen 68! These pens contain small parts. Small parts are dangerous. Kids may swallow them and they may never come out in their poop. You may drop them into a hole that is only big enough for them to drop into and never come out again. I have no issue with this design. Actually, I DO have one minor issue, which is very personal. I have a strange tendency to want to cap the hexagons back together perfectly aligned. There is only 1 way to align them. For the pointVisco, it adds to the burden of alignment by making me have to consider different permutations to cap the pen. Should I cap it such that the slants are in the same direction? Or different directions? I feel apologetic towards the Pen 68 and point 88 for always calling them “the other two”, as if they are a group of ostracized twins who should not mix with the more premium (in terms of pricing) pointVisco. But the post is already very wordy, so I should save up on phrases. Anyway, the black rubber grip is a nice design concept on the pointVisco, because it gives my finger some support while I am writing. When using the point 88 in the past, I had a tendency to hold the pen rather close to the nib and grip it really tightly. So I developped a callus on the finger where the pen rests upon. For this pointVisco, I can foresee a callus too with long periods of writing, but the rate of formation will likely be much slower than using the point 88. The downside? I can already see tiny specks of dust getting stuck onto the rubber grip area, so this might be a potential problem for those who want their pens to be spotlessly clean. 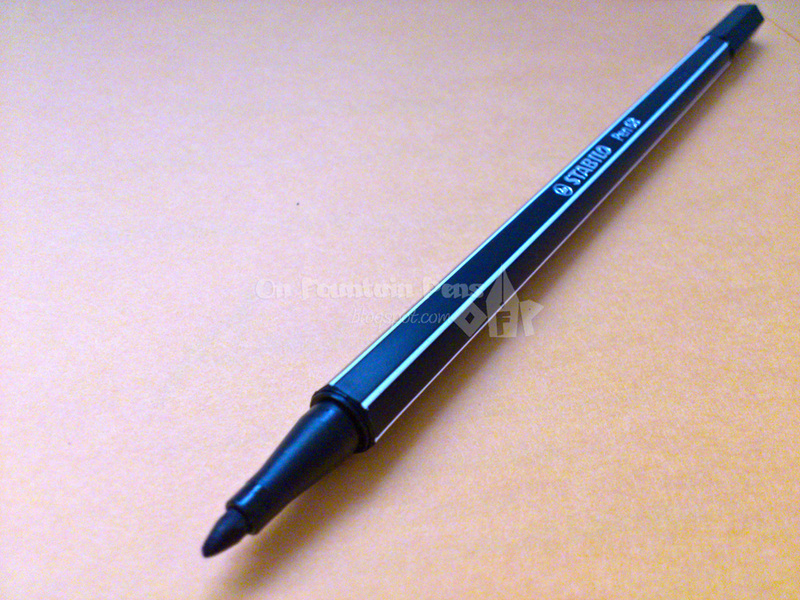 When I tried the black point 88 pen, which was brand new, it was very smooth. I took out the two old ones (green and brown) that I have bought about 7 years ago – not so smooth. Some problems with the ink flow, which did not flow out properly especially for the brown one. 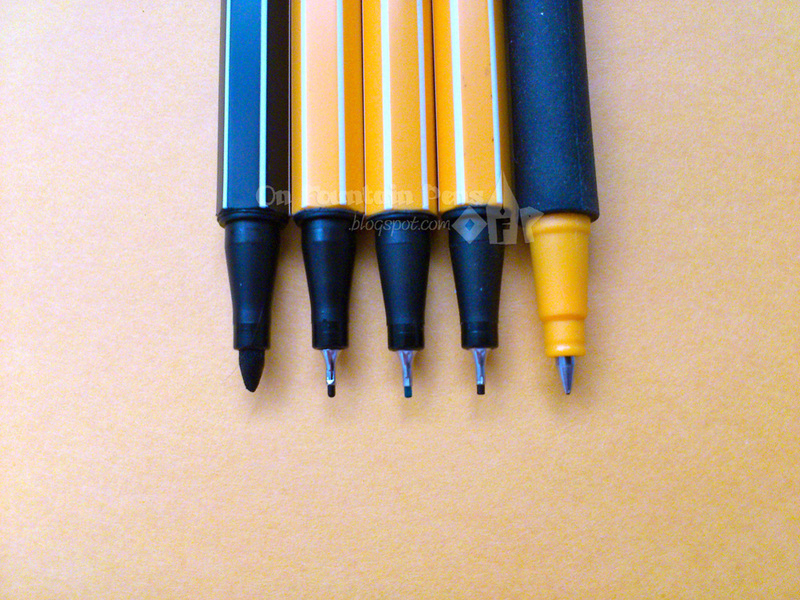 The brown and green point 88’s are really old pens that have been used extensively before. 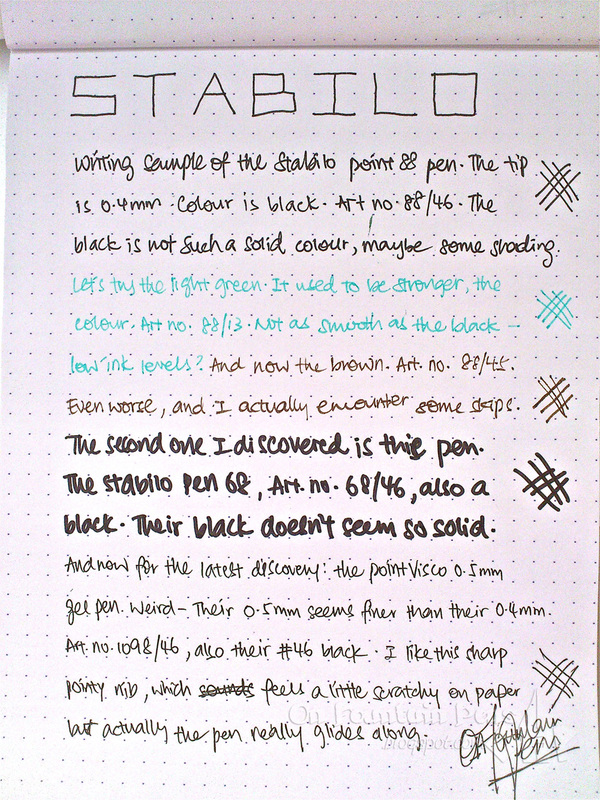 It is possible that the pens are drying out, or that the ink levels are too low to produce a decent wet line. In the midst of writing, I found out that there seem to be some line variation from the older pens. Some line variation on the green and the brown? It doesn’t seem so clear in this picture, but if you scrutinize the actual writing sample, there is a minuscule bit of line variation. The brown’s should be a little more obvious. I attribute this to the low ink levels of the pens. Also, after prolonged writing at a certain angles, the nibs might have become flattened, causing it to look a little like an italic stub which might be the cause of the line variations. Left: the black point 88, still round. Centre: the green one, slightly less rounded. The pointVisco has a rather fine and sharp nib point, which I really love. The scratchiness in this case does not indicate a lousy nib. In fact, it is a very smooth writing experience. I compared the size of the nib with 4 other pens, and found that the pointVisco looks like it has the sharpest, cleanest and the most pointed nib of all. The Stabilo Pen 68 comes in FORTY different colours. How cool is that! The Stabilo pointVisco comes in 10 colours. There is a Stabilo GREENpoint which has a very similar design as the pointVisco. It is 98% recyclable, for those of you eco-friendly people out there. But this is not a gel pen. It’s a fineliner. I put it together with the pointVisco simply because of the design. Just sayin’. I bought the point 88 at 1.20 SGD, Pen 68 at 1.30 SGD and the pointVisco at 2.60 SGD (a little too expensive in my opinion, this last one), at Popular Bookstore in Singapore. To buy it online, I did a quick search and saw that Cult Pens sell pretty much the entire range of Stabilos! So take your time to browse through their online catalogue. Don’t forget to also leave a comment if you had some experience with these pens, no matter good or bad! Hello Stacy, great to hear from you. It's an encouraging comment and I am glad you found my post useful. Thanks a lot! You have a cool blog! Awesome!! I was looking online for the difference between the 88 and 68 Stabilo pens, and now I have the answer!! Great photos and details – now I know which ones I want! They sell them on the Amazon.com website here in the US now, too. Rock on, Maybelline! I've been looking for Stabilo 88, I guess it's the same as the uni pin fine liners? Hi David, thanks for commenting! I'm guessing you have tons of colours of the Pen 68 ? lol. I love Stabilo "Pen 68". Oh! 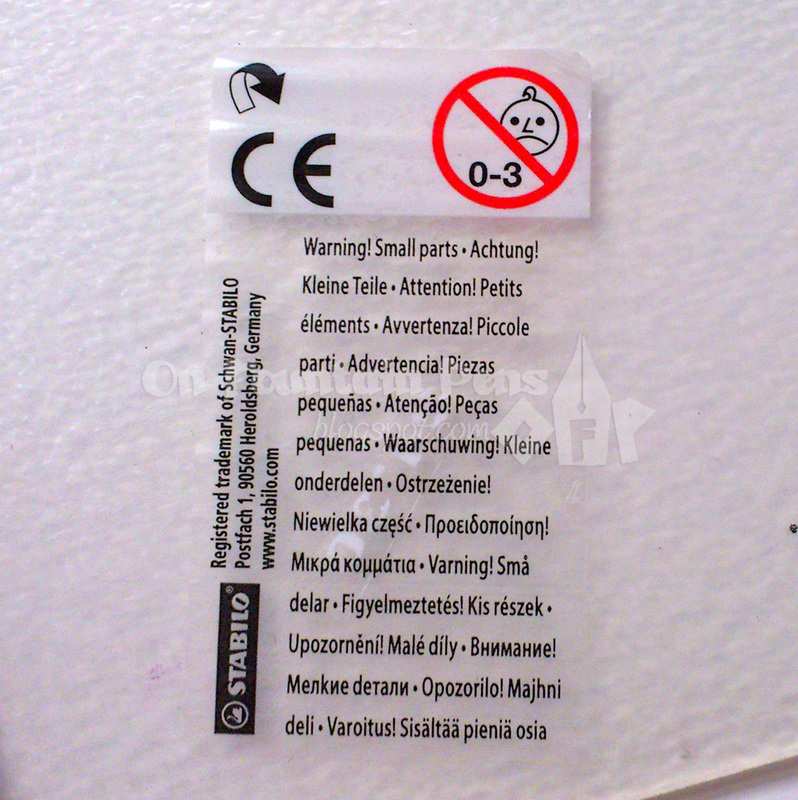 I have a pointVisco, though my "fine" is rather huge. Not at all fine like yours is. That's odd. I've got the purple and I love it because it's really vibrant and pretty!